It is hard to have administration in my classroom. How do you ask for help without sounding incompetent? It’s a brave question to ask; one that may require a little bravery to answer. I’ll be honest: I’ve stewed over your question all week. Partly because it’s a question about evaluation (administration), partly because it’s about insecurity (sounding incompetent) but mostly because the idea of asking for help gets really personal really fast. Let’s start with the most external part of your question and move inward: having administration in your classroom. I used to teach with a woman who would get so nervous about our principal coming into her classroom, that she would literally make herself sick the night before. She would script out every single word of the lesson, have stern talks with her classes about “being on their best behavior” beforehand, and deflate like a used balloon after. She was also an experienced, accomplished, beloved teacher. One time I asked her why she got so nervous, especially given her respected reputation. She told me it was because she “put so much of herself into teaching that she only wanted others to see her very best.” I get it. I do. But here’s the thing: a perfectly scripted lesson was never when she was at her best. I’d watched her teach many, many times and her very best was always when she went off-script, changed the lesson mid-stream, or turned an off-handed student comment into a teachable moment. Here’s where bravery comes in. If you want to give a snapshot of your most authentic teaching self (which means your always in-progress self) you have to forget administration is there. I’ve done this two ways: block them out or invite them in. Otherwise, if you’re so aware of his or her presence, you’ll stop being present with your students and you’ll start hearing your own voice in your head and second-guessing everything. If blocking your administrator out doesn’t feel right, then I’d invite her in. Hand over a copy of the assignment, put her in a group with other students, suggest she ask the students what they’re learning. In this scenario, you never leave that teaching groove you’re in. Moving inward, I think it may be impossible to avoid the fear of sounding incompetent when we ask for help. No matter how uncomfortable that fear may be, it’s not what we should be afraid of. Rather, what’s most dangerous is how we’re likely to compensate for our fear by defending and deflecting. We’re not likely to defend or deflect when the help we seek is to fix something. When we need help with the new attendance program or finding the right piece of technology for that project we have in mind, asking for help isn’t so tough because it’s not about us. Even if it’s a new teaching strategy that isn’t clear, the ask is really about fixing something outside of us, not inside of us. And the craft of teaching is all about what’s inside us, isn’t it? 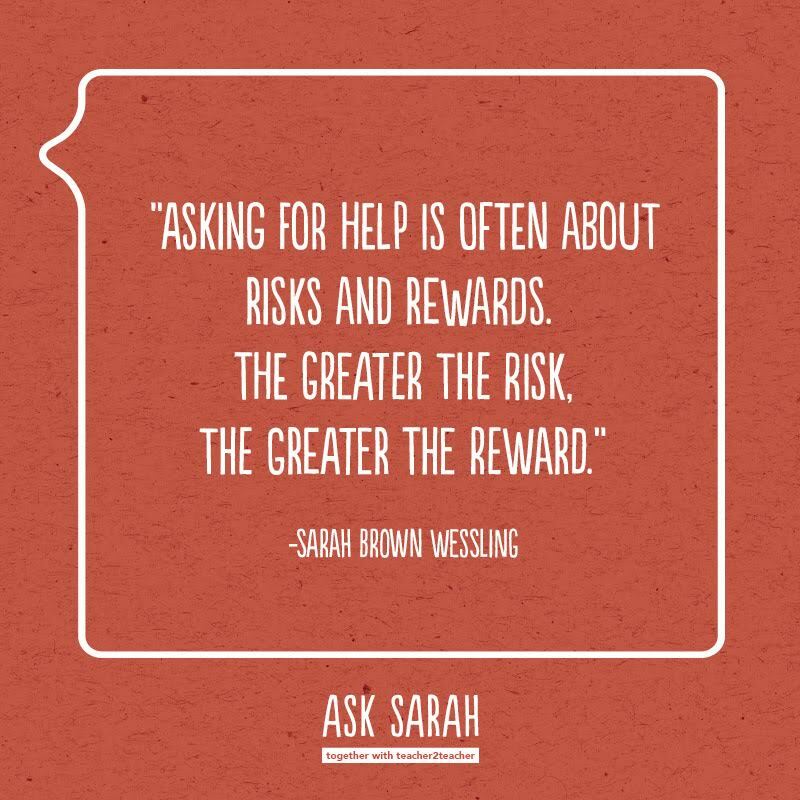 Which means we have to embrace this fear with bravery, knowing that the asking for help is about risks and rewards: the greater the risk, the greater the reward. Can I talk through this with you? I really want to get better at this, but something still isn’t clear to me. I’m open to change, but I need you to help me see what this looks like in practice. I know this is a growth area for me, but I need you to help me see the first steps. If you’ll be patient with yourself and recognize that asking for this kind of help doesn’t prevent, it propels. Perhaps the most inward realization of all is knowing there’s a conscious concession in asking for help, a self-imposed humility at work. Asking for help means self-awareness (whether we’re ready for it or not) is on the other side. Do you remember that scene from The Neverending Story where Atreyu must look at his real reflection in the mirror? Do you remember how he doesn’t see this heroic warrior, but a frightened and slightly awkward alter-ego? Yet he carries on in spite of this moment because his purpose isn’t his own victory or glory, it’s about others. It’s humility. The best work will always summon us to ask for help because it will be the work that goes beyond strategies and technologies and into the empowering of our learner. I know this may all sound heavy, but believe me, there’s lightness in letting go.